DEALER SALES BROCHURE. Sales card was stapled to brochure was gently removed. 2013 FORD F-150. Item was received in new condition. Mint quality is rare. Manufacture brochures are mass produced for average quality. 1983 Ford Mustang Factory Sales Book Brochure 5.0 Car Lot. This copy was clearly tossed around the desk a couple times. However it is in tact and a fun ride to the past. Fast free shipping. I used to sell on eBay in the 90s. Had a feed back in the neighborhood of 5000. At some point the account disappeared. I am just getting back to it but please buy with confidence. Items will be shipped on time and as described or your money back. This is near mint condition with a little discoloration due to age. All Original and very RARE. This is NOT a reproduction. It talks about things such as Dead Battery Door procedures, how to lift the vehicle, car and maintenance, etc. It is a great booklet and in very nice condition. Date started shows January 5, 1937. Ford Dealers Inventory Book by Inventory Record Bureau, Salina Kansas. Details: W 11.25 xH 8.75 xD 1.5Weight 41.6. Pages: ~250. VTG 1975-77 FORD DEALER RETAIL ADVERTISING KIT! MUSTANG/PINTO/TORINO/LTD/TRUCKS! MUSTANG/PINTO/GRAN TORINO/LTD/TRUCKS! MUSTANG II. VANS & TRUCKS TOO. TRUCKS & VANS. MADE FOR DEALER, NOT FOR THE PUBLIC!& MORE! STATION WAGONS. 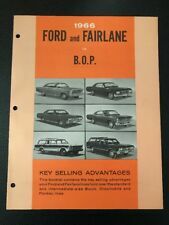 ONE Ford 406 High Performance Parts and Accessories Brochure. Item as is: light wear and surface scratches, nice shape (see pictures). Confirm this item is compatible with your vehicle BEFORE purchasing. 1963 Ford color and trim selector dealer album, nice! Galaxie, Fairlane, Thunderbird. Most of these albums were discarded once the 1964 models arrived. This one has survived in excellent condition and is complete. Original full set of 1936 Ford News Magazines. This set of 12 Magazines cover January through December of 1936. They are in good condition for their age with minor wear, soiling and blemishing [see photos]. 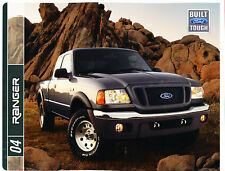 Original 2000 Ford Truck Dealer Source Book Hundreds of pages of specifications, options, accessories available for all the trucks--Ranger, F150, F250-F550 Super Duty, Super Duty 650/750, Econoline General Information on Trucks also Good Condition Measures approximately 11.5" x 11.5" x 3.5" . Original 1977 Ford, Color & Upholstery Book. 12 " x 10 " . 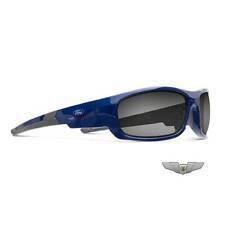 Covers all Ford models & Trucks. Ford, Mustang, T-Bird, Etc. Pinto Pangra. Objective: Perfection in Performance. Back page gives the 3 kit options along with pricing. Der coolste Mustang aller Zeiten. Das Sondermodell Ford Mustang BULLITT lässt eine Legende wieder aufleben: Den Ford Mustang GT Fastback, der 1968 auf der Kinoleinwand Kultstatus erlangte. 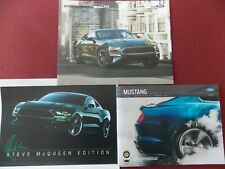 In Anlehnung an den Ford Mustang BULLITT entstand diese einmalige Kollektion. ONE Ford 427 Single Overhead Cam Engine Service and specifications manual. Item as is: light wear and surface scratches, nice shape (see pictures). Confirm this item is compatible with your vehicle BEFORE purchasing. All of the material inside is fine. This includes several samples of the 1971 car literatures. Original full set of 1940 Ford News Magazines. This set of 12 Magazines cover January through December of 1940. They are in good condition for their age with minor wear, soiling and blemishing [see photos]. 2014 FORD F-150. DEALER SALES BROCHURE. Item was received in new condition. Mint quality is rare. Manufacture brochures are mass produced for average quality. This is part of my personal collection. Original truck brochure, good condition, see last picture for size. ________________________________________________________________________________________________________________________We We sell a wide variety of vintage and antique toys including toys from the 1930's, 1940's, 1950's, 1960's, 1970's and 1980's. We have one of the largest antique toy stores on eBay so please be sure to check out our store to find that must have item that you have been missing from your collection. We are constantly purchasing new items from collections, estate sales, auctions, flea markets, etc. so be sure to check back often if you do not see the item you are looking for. Please feel free to contact us with any questions that you may have. We strive to ship quickly and securely. Combined shipping is always available. This is the November 1936 Motor magazine Annual Show Issue. 10 X 14" with a whopping 340 pages, this monster weighs over 3 lbs! Over 1,000 photos and illustrations. Fabulous futuristic cover art by Radebaugh. In excellent condition. did not show all the pages. 2005 Ford F-150. Cover has light creases on left edge & light scuff stains, otherwise in very good condition. 8 1/2" x 11". Original 1946 Ford Sales Brochure Color Deluxe 6.5" x 8"
Original 1946 Ford Sales Brochure Color Deluxe Deluxe brochure but measures a smaller size Measures approximately 6.5" x 8" All Models in Color--including the station wagon and convertible 20 pages Form No. Original set of 1939 Ford News Magazines. This set of 11 Magazines cover January through December of 1939 but is missing the July Edition. They are in good condition for their age with minor wear, soiling and blemishing [see photos]. This original material contains inside information on Ford prototypes that were the benchmark of futuristic automotive thinking. You will find pictures of concept cars that never saw the factory; and some--such as the Mercury Turnpike Cruiser--that did! Includes pictures of futuristic drawings of exteriors and interiors, prototypes, clay models, and styling drawings from the development of the actual 1957 Ford & Mercury cars. There is also a section called "Advanced Styling" that anticipates what they thought cars would look like in the year 2000 A.D. You won't believe how much the pictures look like "the Jetsons." 47 pages in MINT CONDITION! Buy now for this rare catalog from the idea men at Ford. The booklet talks about the history of engine performance developed by Ford and has many stories within the booklet. If you are looking for a nice history of engine performance, then this is for you! This was used to train the sales team at local dealers on the features of the Ford, Fairlane, and Falcon vehicles vs. the Chevrolet, Chevelle, and Chevy II. All Original, see pictures for quality and details. 2005 Ford F-Series Super Duty. Cover has light creases on left edge, otherwise in very good condition. 8 1/2" x 11". ""The Ford Legacy" - Booklet" - Booklet. If you are looking for a nice piece on the history of what Ford is all about, then this is for you! This was a dealer only item. with custom features and color photos of each model.Also lists options and power teams. 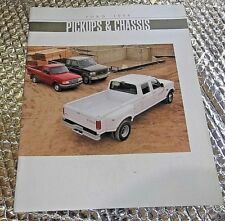 Up for sale is set of 4 Sales Brochures - 3 -1984 & 1-1989 Ford F-Series F-150 & Ranger Truck Original Sales Brochures. In very crisp clean condition and light shelf wear from storage. With masses of 88 cm length / width 87 cm / 90 cm in height and only 2.4 kg weight ideal is with one hand folding chair to settle comfortably on any kind of leisure activities. Wrapped the Chair in a nylon bag is worn simply with neck strap over the shoulder! Sedan Tudor Ford. Sedan Fordor Ford. Coupe Club Ford. Details: W 9.25 xH 13 xD 0.1. Rohm and Hass designed plexiglas concept cars. Very unique, good condition. 10" X 12". 20 vivid color pages. Has edge wear with tears on edges of front and back covers. 2005 Ford Crown Victoria. Crown Victoria, LX & LX Sport trim levels. 8 1/2" x 11". Customline Fordor Sedan. Customline Club Coupe. Customline Tudor Sedan. Customline Sunliner. Customline Victoria. Mainline Fordor Sedan. Mainline Ranch Wagon. Mainline Tudor Sedan. (De har en sterk motor og et vakkert karosseri, de er usedvanlig okonomiske i bruk og er bygget efter moderne stromlinjeprinsipper. Spesifikasjoner Pa ryggen. Specifications on the back.). Note: Norwegian. Original full set of 1938 Ford News Magazines. This set of 12 Magazines cover January through December of 1938. They are in good condition for their age with minor wear, soiling and blemishing [see photos]. 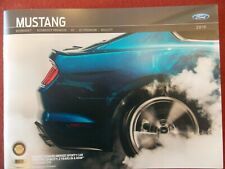 NEW 2014 FORD MUSTANG SHELBY GT500 SVT 34 x 11" BROCHURE DEALER ONLY POSTER!